Are you a passionate mountain biker? If so, you must be well acquainted with the role of fitness in mountain biking and how pivotal it is for Long Distance Mountain Biking. An epic ride does not need a magic diet or secret training, but merely a change of perspective! How To Add Miles To Your Epic Voyage? The central rule to help your body develop an epic stamina for the epic ride is crucial for succeeding at it. Begin by gradually increasing your total length of miles each day to increase your stamina. Add more or sealed-road riding to your speedometer and crank bonus miles without wearing out your inspiration and energy. The best advice to keep adding more distance to your routine mountain biking is by being focused and pedaling beyond your last stop! The trick is to train the body beyond its limits by increasing the duration and intensity of the ride. You don’t need to wear a cutting-edge heart rate monitor, but being sensible about how well you can manage a ride is necessary to train productively. 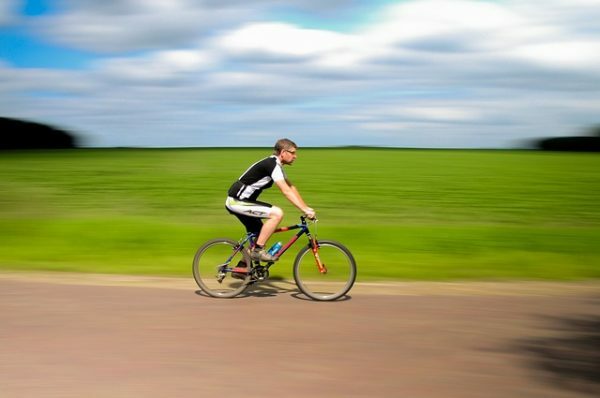 Instead of plunging out for a 50-mile trot into the countryside, covering multiple laps around your residence is enough to train for long distance mountain bike riding. If you keep off the dirt, Long Distance Mountain biking in the city is challenging to your training sessions too. Endurance coaching is the next biggest challenge to long-distance mountain bikers. The quintessential tip is to keep your heart rate normal by decreasing your riding speed. The easiest way to check if you’re pushing your body too much is by checking if you’re gasping for air in order to complete even one sentence. The biggest challenge to Long Distance Mountain riding is the uneven terrain. From hills to steep climbs, there are many threats to cozily riding the mountain. Riding such erratic terrain is also a warm-up for your main training sessions. Often, mountain riders claim that downhill ride is the best part of treading the mountain. Post a steep and daring climb, a downhill ride is definitely the toast! Downhill rides must be tactically used to rest and recharge after hilly rides. The essential rule is to continue pedaling without crashing and avoiding terrifying terrains without a second loss in a decision. Cruising across the terrain with a blue level expertise is recommended than black diamond plunges. Yet another important lesson of long distance mountain bike riding is the motivation or spirit of riding. Popularly renowned to be the Queen of Pain, Rebecca Rusch is a pro mountain bike rider who elaborates in her renowned book titled, Rusch to Glory that how-much-so-ever one is overwhelmed or disturbed emotionally by an event, the pain or joy will be momentary. Most veteran riders advice novices that the first rule of long-distance mountain biking is to recognize the status of your body. Often, fatigue is the best sign to pick up that your stamina is empty. Often, riding after feeling exhausted is drudgery and excruciating! You must also be sensible to eat what you need for your future destinations, rather than for the terrains you’ve already covered. Oftentimes, riders make the routine mistake of eating atop the climb as an acknowledgment of covering the half route. This is wrong if your food consists of energy drinks and protein bars. Real food is quintessential for owning the long mountain riding skill! Mountain biking itself is not a bed of roses. There is no necessity to sugarcoat the same. For every biker, challenges seem extreme when on a long trail of mountain biking. Often, partners are obsessed about crosschecking the total miles every few minutes. The body begins to weaken and blacking out becomes a background when you’re pushing too hard. At times, your body and brain might together inspire you to quit, but the point is to focus on rational decision making. Often, dismissing the whining rant inside the head is a bigger obstacle than sores knees. Yet another foolhardy act is to neglect the computer notifications on the handlebars. Bikers celebrate too soon thinking that the ride is over. Using a computer generated GPS will help ride without being disappointed. Cheap mountain bikes display erroneous speed as well as total distance covered and confuse the rider. The best way to cope with the same is by keeping yourself motivated with the fact that your ride is never over! The best antidote for making your long distance mountain riding a success is by preparing yourself with 100% willpower and endurance. Discomfort is routine to mountain bikers, but when you’re braced for a long distance mountain ride, discomfort is gigantic. Your willingness to combat the same is all it takes to own the ride. By strategizing a sensible route plan after incorporating food and beverage stops, you can pedal past your nightmares and horrors. If you are motivated throughout your training sessions and main rides, you will want to ride more than give up. Taking necessary stops and recharging your body is necessary to complete your long distance mountain biking as well as explore it more in the future. Above all, the most important lesson is the feeling that dawn immediately after completing the ride on how super-human your endurance and biking skills are. Surely, the sky is the limit for you after the epic ride!